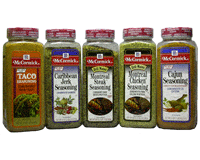 Usage: Lightly rub both sides of steaks, hamburgers, chicken, fish or pork with McCormick Caribbean Jerk Seasoning, and grill or pan fry. Place meat in bag or pour over meat. Ingredients: Salt, Spices (including Red Pepper), Dextrose (Sugar), Caramel Color, Chives, and Sulfiting Agents.